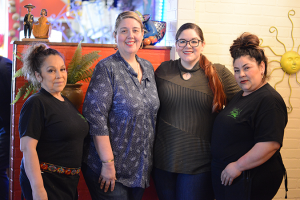 Marcella and Emma Garcia, joined by some of their waitstaff, have been working to keep Marcella’s a family run business over the decades. Serving up Mexican cuisine in Modesto for over 40 years, Marcella’s Mexican Restaurant and Lounge has stayed consistent and has stayed a true family owned establishment in the Frontier Town Shopping Center. The menu has not changed very much since the beginning, so guests can still find their favorites at Marcella’s to this day. The mother/daughter duo of Marcella Garcia and Emma Garcia continue to offer good food, refreshing beverages, and superb customer service, keeping the family business flourishing. They have a full bar and a lounge area where they serve up some guest favorites like their margaritas, fuzzy Mexican, and the Paloma. They also offer a variety of beers and refreshing Micheladas. 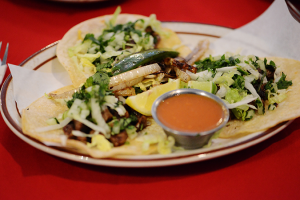 Marcella’s has remained a mainstay of Mexican restaurants in the region because of some of their popular dishes, like the street tacos and the No. 14. Keeping up with the food trends and the love for tacos, they added street tacos to the menu, which are a guest favorite. 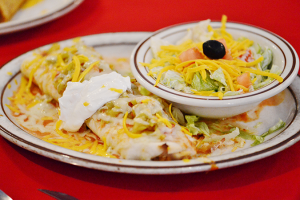 Another popular and delicious item on the menu is the number 14, which is a combination plate that includes a chicken enchilada in a flour tortilla with house made green sauce, Jack cheese and a small Tapatia salad. They also have a few breakfast items like huevos rancheros and huevos con chorizo or if guests want some scrambled eggs and ham Marcella Garcia said they can make that too. The menu has quesadillas, chile Colorado, chile verde, tacos, and burritos, which Emma Garcia explained is all made fresh in house. The dream of opening a restaurant began with her father, Alfredo Duran Sr., which led to a restaurant in downtown Hughson around 1970. After a year in Hughson they closed and moved their restaurant to Oakdale Road in Modesto. Then in 1977 they opened Marcella’s #2 on Tully Road, which is still there today. Duran worked the fields and worked at a restaurant called Carmen’s Mexican Restaurant in McHenry Village, which ignited the interest of owning his own restaurant. After her mother passed, Marcella Garcia and her father continued to work both restaurants then they closed the Oakdale Road restaurant in 1996. Her father Duran Sr. passed away a year ago in March but his legacy continues. The days in the restaurant business began at a young age for Marcella Garcia, as she remembers helping her parents with anything they needed like pulling the stems from the chiles, busing tables, or being the hostess greeting people and answering the phone. The restaurant was named after her and as fate would have, it the restaurant was left to her after her father passed. This family affair continues as her daughter Emma Garcia is now managing the restaurant along with her mother and father Jorge. Marcella and Jorge met at the restaurant when he began working there as a busboy. They have been working side by side ever since. Emma Garcia was named after her grandmother and one of the driving forces behind the restaurant. Emma Garcia began working in the restaurant during her freshman year of high school. Marcella Garcia’s other two children work at the restaurant helping keep it a true family business. Even the 18 employees that work at the restaurant are considered part of their family. Besides the delicious food that is made with love for their customers, Marcella Garcia shared that they have stayed in business for so many years because they are consistent, stay on top of things, and continue to have good customer service. The restaurant, at 3507 Tully Road, is open seven days a week for lunch and dinner, and hosts a happy hour from 3 p.m. to 7 p.m. Monday through Friday with $3 margaritas and $3 well drinks.